The argument could be made that this post belongs in the multimedia/photo gallery section; however, I think it will be more helpful to people here. Basically, I'd like for people to post pictures of their cars with the installed wheels & winter tires. I know many of you have posted these pics in other threads, but I thought that having a single thread with a library of suitable winter wheel/tire packages would be invaluable to other owners who are considering the purchase of a new set of wheels/tires for the winter. Searching through dozens of threads can be rather exhausting. I'll start this thread by posting the pics that I have acquired so far through limited searching. I had been naming the image files with only the basic information, so I'm sorry if I don't specify the owners of these vehicles or detailed information about the setups. I still haven't decided which package to purchase, so any additions to this library would be greatly appreciated. Thanks! I don't believe he has winter tires on here, but somebody probably could if he/she desired. I'm glad I live where I don't have to worry about that. Not much to see on mine, but here's my 8 with Dunlop WinterSport M2's (225/40/18's) mounted to my stock 18"s. Eventually these will become my winter wheels, and I'll get some nice light 18"s for my summer tires. My winter wheels are a set of 17" Kazera KZ-V rims with Pirelli Winter Snowsport tires. With the shortages in 18" winter tires in the middle of the season last year (and probably 17"s as well), it's very wise to be thinking about it now, rather than after you slide into a snow drift. I had ordered my snowshoes weeks before I took delivery of my RX8 since I've had prior experience with the Potenzas in the snow. Does anyone know when the leading retailers i.e. tirerack market their winter packages? When I check the sites now, I don't see much and when I called a couple of places, they had nothing in stock. Looks like you can get a package here . Sumitomo HTR+ in 245/40WR18 Ultra High Perormance All Season Radials mounted on my stock wheels! Nice thread... wish I had access to it last fall. Be careful when ordering the ASA LW5 rims. They come with blue center caps as the default from Tire Rack. The silver caps are available, just ask. See this thread. Snow and ice are just around the corner for those of us who live up north. I thought I'd bump this thread to help out those looking for a new set of wheels and tires for the winter. TireRack just got most of its winter tire stock within the past couple of weeks, so you should have a large selection if you buy soon. Don't wait too long or you could be out of luck, as some people discovered last winter. I purchased a set of Sport Edition Fox 5 wheels (pic of wheel below), and Bridgestone Blizzak WS-50 winter tires (size 225-50-17). Sorry Gordon, I didn't follow your recommendations about the WS-50. Actually, I was prepared to buy a set of Dunlop M3s when I called TireRack, but the salesperson was adamant that the WS-50s were significantly better in snow and ice than any "performance" winter tire, including the LM-22, M3, Wintersport, etc. 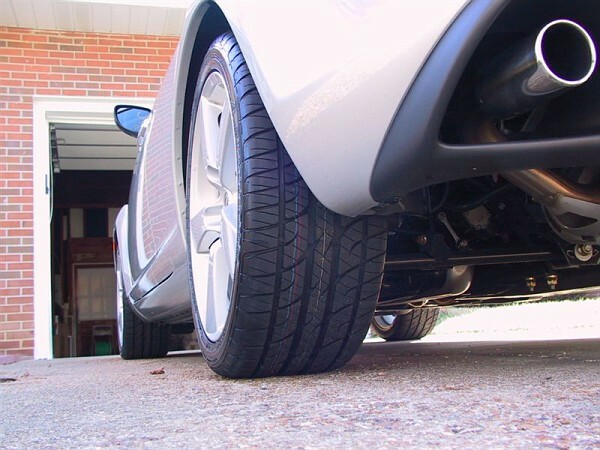 according to tests that TireRack conducts. He admitted that the WS-50s would compromise handling on dry roads, but my main concern is being able to get to work in the worst of conditions. After reading dozens of reviews regarding the WS-50 on TireRack's website, I feel confident that the WS-50s will work okay for me. An added benefit of the WS-50s is that they're significantly cheaper than the LM-22s or M3s. The total cost of 4 wheels, 4 tires, a set of locking lugnuts, and shipping came to $1157. I'll post pics after I install the new wheels and tires, but I suspect it won't be until late November or December. Wow...thanks a lot for the thread! Keep the pics coming folks. I'm going to have to order some winter tires / wheels pretty soon. Huh? 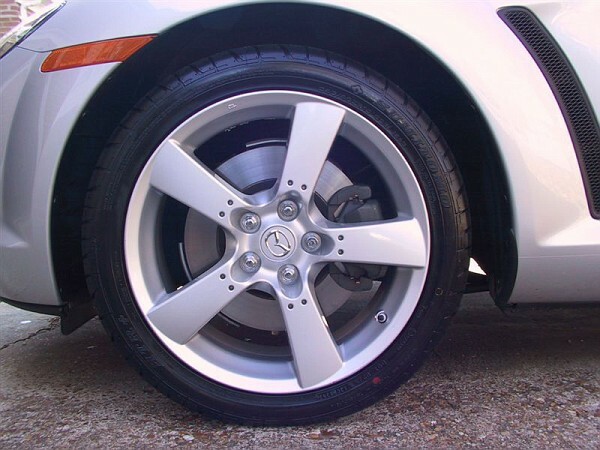 Where is everyone getting 17" wheels for their RX-8's? Is TireRack simply out of stock right now? Are there other sources I should consider? Please help me understand! I want to get my winter tires/wheels before everyone else is racing to get them. Huh? Where is everyone getting 17" wheels for their RX-8's? Is TireRack simply out of stock right now? I have the same car and did the same dance in November '03. Call Jim at Tire Rack in South Bend. Tell him what you need... he'll hook you up. Also, be sure to look at this thread with regard to Tire Rack's customer support.